Cool temperatures + top talent = fast times. That's a simple formula that has led to the rise of one of the best events of the fall season, a cross country meet held on a track. The 11th annual edition of the Dash for Doobie is set for Saturday, and as always it will bring some of the best distance-running talent from multiple states together for ultra-fast 3200's! Now the meet is sponsored by Hoka One One, serving as one of the main hubs of the Postal Nationals series that they have resurrected in recent years. Not only can individuals get outstanding times and potentially knock out indoor state meet qualifying marks in the 3200, but teams can also upload their times to contend nationally in the modern version of the old mail-in competition. The Elite sections are loaded once again, but the talent doesn't stop there! Make sure you check out the full entries, and watch the sections before the final races to find breakout stars and future Elites. TRAFFIC ALERT: if you're traveling to Dash for Doobie this weekend, please note that Business 40 will be closed through downtown Winston Salem, starting Saturday morning. This race drew the top runners in North Carolina, as usual, but this year's top section has an unusually strong and deep group of out-of-state athletes. The South Carolina 3A and 5A state champions, Colin Baker and Dolan Owens, will be in the field Saturday night, along with West Virginia A/AA winner Aaron Withrow. Likewise for Daniel O'Brien, who won the Virginia independent schools 2A title this fall. They will be joined by North Carolina 4A champ Anton Idhammar, as well as 3A winner George Hotelling. That's 6 state champions in one race! But winning a cross country title is not the same as winning a 3200 on the track. Sam Gilman (Hilton Head) has the best PR in the field at 9:09, followed by Baker, O'Brien, and Ben Verchick (Union Pines), all of them under 9:20. Baker has the fastest 5K time in the section at 14:48, which by itself probably makes him the favorite; behind him come Owens and Nick Scudder (Millbrook). If you're looking for some sleeper candidates with strong track resumes, look to Tim Haughton (Apex Friendship), the #2 returner in NC int he 3200, and Kyle Durham (Weddington), who holds the top returning 1600 time in the state. And while we're on the topic of the 1600, you should definitely NOT count out Idhammar, who ran 4:17 on the track before winning the 4A title this fall. There are several other runners in the field that have broken 9:30 in the past, so expect there to be at least a sizable chase pack, if not a large lead group. This is a very deep group, and with some potential 9-minute threats, all they need is someone to set the pace well early - and it wouldn't hurt if someone could force the issue through the middle, too. Carmen Alder has been an unstoppable force all season, losing only once (to national superstar Kelsey Chmiel at Great American). Expect that to continue Saturday, as the Pinecrest sophomore enters with by far the best 5K and 3200 credentials in the field: 17:28 on the course this fall, and 10:36 on the track last spring (which puts her among the top 50 returners in the nation). 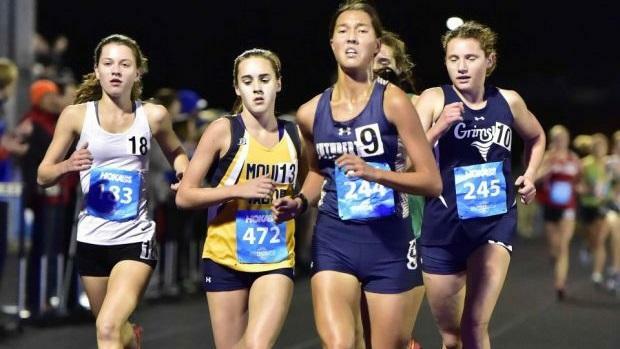 If anyone can stay close, it would most likely be Natalie Tyner (Laney) or Katherine Priu (Cardinal Gibbons) - both broke 11 minutes last spring, the only two girls in the field other than Alder who can claim that feat. If you want a dark horse candidate, look to freshman Jenna Hutchins (Science Hill TN), who clocked 17:37 in her first high school cross country season to win the TN A-AA state championship. Hutchins best 3200 is 11:21 from back in 7th grade, and she has improved so much since then that she should be considered a strong candidate for sub-11 this weekend. What's more likely, though, is that Alder will pull away over the final 4 laps, leaving a massive chase pack behind her. Don't be surprised to see Jonna Strange, Ainsley Cooper, and Hayley Whoolery right in the thick of that group, as all three are excellent 3200 runners. And if you're looking for runners with a combination of cross country endurance and track speed that could turn heads this weekend, keep your eyes on Alyssa Hernandez (2:15 for the 800) and Caroline Todd (2:18). Finally, make sure to catch the 3200 debut of 2A state champ Hannah Preisser (Carrboro), who has been a revelation this fall but has never been in a race with this much individual talent. The top runners in section 6 on the girls' side are very good, and should be able to push each other to strong enough times to knock off some of the runners in the Elite race (this is a tradition at Dash for Doobie!). Anna Davis (Weddington), Bailey Reutinger (West Forsyth), and Emma Kincaid (Grimsley) have all been 11:32 or faster in the past, and will be looking to go under 11:20 this weekend. Isabel Muehleman (Hilton Head SC) should also be in the mix in section 6, and Molly McGowan (Cardinal Gibbons) has an 11:33 on her resume. That should be a strong lead group, and that kind of close competition can spur big times! On the boys' side the same theme holds true: section 11 will be very competitive. The 2A state champion in the 3200, Ben Armentrout (Atkins), will definitely push the pace in the middle of the race, and that could lead to excellent times (his PR is 9:33). Jack Dingman (Northern Guilford) posted a 9:30 on the track last spring, which should put him right up front with Armentrout. Cooper Castellaw (Alexander Central) and Stephen Larson (Weddington) both have PR's of 9:40, and Hunter White (North Henderson) has clocked 9:39. With another cross country season under their belts they could be ready to break 9:30. Stud freshman Nate Jaster (Weddington) will be interesting to watch here; he has a PR of 10:12, but that was before he barnstormed North Carolina with arguably the best 9th-grade XC season ever, running 15:47 and finishing 5th in the 3A state meet. With several other strong runners in the race, section 11 could see several lead changes and, like section 6 of the girls, perhaps some overall top 15 times as they knock of some of the Elite runners. In other races, it would be great to see Sloan Walter getting back to full speed, and when healthy she is one of the best in the state. Her PR is 10:55, but she has had a rough 2018. Here's hoping this race can at least be a springboard to a MUCH better 2019 for her! John Paynter of R.J. Reynolds, running in section 10 of the boys' races, has a 9:43 PR and could set an early standard for the final two sections to match, with Tamer Metwalli (Cannon School) likely to be right there with him. Elliott Kleckner (Croatan) is the only other freshman (beside Jaster) competing in the top 3 sections Saturday.